How is your soul today? Is intimacy with God strained or non-existent? Has the relationship gone stale? Have you thanked Him and adored Him today? Or...are you dry? Or like Paul Little (now deceased) wrote in his classic book, How To Give Away Your Faith, is your relationship like Coke that has lost its fizz or cold mashed potatoes? When did you last go to the well? 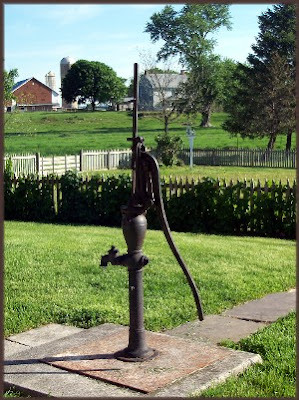 Is the pump primed and ready or is it collecting rust? The great Giver of Living Water invites you to sit in His presence and be renewed, refilled and refreshed as you drink from Him. Drink deep and partake often of that life-giving water that only Jesus can give! Dear David...This IS a nice picture! That is why "Greater Vision" is my favorite group. Rodney G. has written so many songs about the Water. My favorite is, "I Asked Him For Water, He Gave Me The Well". Isa 55:1-3...Ho, every one that thirsteth, come ye to the waters, and he that hath no money; come ye, buy, and eat; yea, come, buy wine and milk without money and without price. Wherefore do ye spend money for that which is not bread? and your labour for that which satisfieth not? hearken diligently unto me, and eat ye that which is good, and let your soul delight itself in fatness. Incline your ear, and come unto me: hear, and your soul shall live; and I will make an everlasting covenant with you, even the sure mercies of David. I was reminded of the above scripture after reading this post. We memorized it (actually up to verse 6) as a family a year or two ago. Thank you for the refreshing and encouraging thoughts!